BBQ, tacos, and craft beer, what’s not to like? Located on Butler Street in Lawrenceville next to Row House Cinema. I’ve heard about this place a number of times. Recently, I read it’s write up in the Pittsburgh Magazine Best Restaurants of 2016 article. During this month’s date night the wife and I decided to go to dinner here. It’s a serious industrial / hipster vibe with exposed brick walls and duct work, a great looking bar, and everybody in casual clothes. One of the my most important areas of any restaurant is their beer selection. Smoke has about ten beers on draft and about ten more in cans. They had one local beer on tap, Grist House “Fire on the Hill IPA,” (7.5% 10oz $5) that’s located in Millevale, PA. This might be my new favorite beer. My wife got the house Margarita, which is was made with fresh squeezed juices. I had a sip and it was the perfect refreshing drink with some tacos. Though it wasn’t her favorite Margarita in the city. The Pittsburgh Magazine article references the pork, brisket, and mingas tacos so we decided to get one of each. Along with a salad and Mac N’ Cheese. The table next to us got the Hot Bowl O’ Cheese, queso with homemade chips, and I think my wife still hasn’t forgiven me. Before our main course arrived, I got a second beer, Avery Imperial IPA (10.5% 10oz $5). It was good but I’m not a huge Imperial IPA fan because I feel like they have too strong of a liquor taste. I enjoy the bitterness of a 6% -7% IPA. In the end this might be one of my new favorite places. I already know my wife wants to go back for the Hot Bowl O’ Cheese. 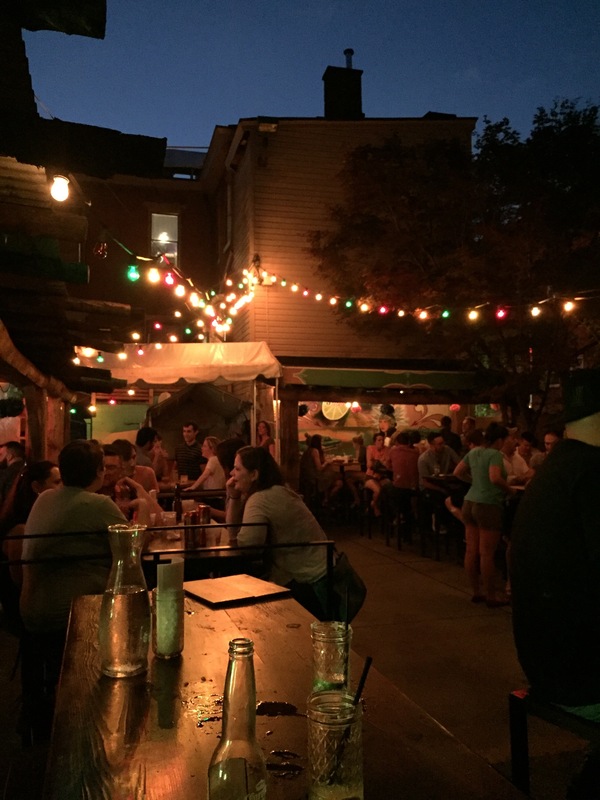 Plus, it’s only a short walk away from our favorite outdoor bar, Round Corner Cantina, with one of my favorite drinks, Shan Diego, which is an IPA mixed with lemonade.